Jemal Inaishvili is President of the Georgian Chamber of Commerce. Whether he is clairvoyant, or just plain lucky, I do not know, but his decision in January 2006 to establish the first national wine competition with a panel of international judges, was a timely one. Within three months, Georgia’s giant neighbour Russia would ban all imports of Georgian wine. 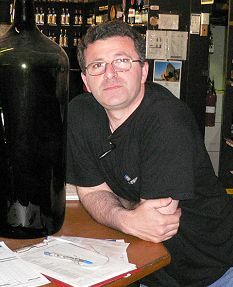 Considering that 80 per cent of Georgia’s 50-million-bottle production is exported to Russia, the news represented a body-blow to the Georgian wine industry. It was back in January that I received a phone call from the Chamber of Commerce, inviting me to judge the first Georgian National Wine Competition, to be held in the capital city of Tbilisi in May 2006. My knowledge of Georgian wine at that point was much more theoretical than practical, though I was aware of Georgia’s very long history of winemaking, and that it had long been considered the best wine producing state of the former Soviet Union. 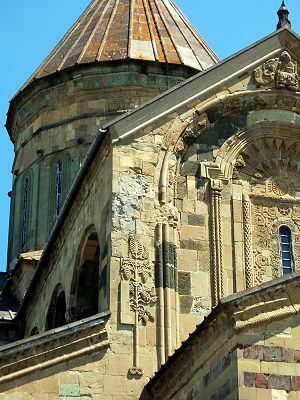 Above: vine carvings on the 11th century Svetitskhoveli cathedral in Georgia’s ancient capital city, Mtskheta. Georgia lies between the Black Sea and the Caucasus Mountains. It declared independence from the Soviet Union in 1991, but civil war and bloody conflict followed, with separatists in the states of Abkhazia and South Ossetia continuing a campaign of ethnic cleansing. In 1995 Eduard Shevardnadze had returned home to Georgia from the USSR, where he had served as Minister of Foreign Affairs, to become its President. But Shevardnadze was deposed in 2003, amidst claims that election results had been rigged. A young politician called Mikheil Saakashvilli led generally peaceful anti-government demonstrations, in a coup that became known as the ‘Rose Revolution’. Saakashvilli was elected President in 2004 and Georgia has been relatively stable since. It has also courted the west, with EU flags fluttering on many buildings, and the receipt of financial aid from the USA. But for all that Georgia’s recent history is marked by bloodshed and conflict, its ancient history is a fascinating one. Some of the earliest remains of European man have been found here, and wine has played a central role in Georgian culture, as celebrated in the recently launched ‘cradle of wine’ exhibition at Vinopolis in London. Most authorities agree that Georgia is the birthplace of winemaking, with 9,000-year-old archaeological remains pointing to grapevine cultivation. Indeed, the Georgian word ‘ghvino’ is thought to be the root of the French ‘vin’ and English ‘wine’. The small statue left is housed in the Georgian National Museum. 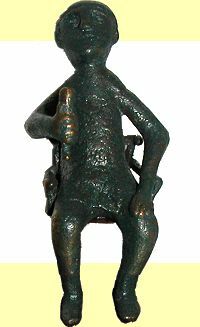 It comes from the 7th century BC, and shows a reclining man drinking wine from a traditional drinking horn. It became the symbol for the wine competition. Around 50 million bottles of wine are produced annually in Georgia, 40 million of those traditionally being lapped up by Russian drinkers. Vineyards are mostly sited close to the Black Sea, composed of 500 indigenous grape varieties, making Georgia a fascinating repository of vine genealogy. Around 40 varieties are in commercial production. Reds from Saperavi have carved a reputation for making excellent wines, with white varieties like Mtsvane and Rkatsiteli also recognised for their quality. Some estates have invested in more modern technology, whereas others have suffered from a lack of investment in vineyards and wineries. There are also traditional methods of winemaking in many estates, where wine is fermented in clay amphora, buried underground. In April 2006 Russia’s Ministry of Health announced a ban on Georgian wine, citing unhealthy levels of chemicals in the wines. The ban has been widely perceived as politically motivated, with claims that the analysis is false, and that this was Russia flexing its muscles: Moldovan wines were also banned, another ex-Soviet state that had embraced the west, and then Georgia’s most popular mineral water was banned by the Russians on similar grounds. Whatever the motivation, the ban is potentially devastating for Georgia. Some 40 million bottles of wine now need to be sold, but where? Wine is an essential part of the Georgian culture, where entertaining guests is a central philosophy of life: tables groan under the weight of food and drink, to be consumed to an endless series of toasts. But the domestic market is extremely difficult to grow: this is a country whose GDP ranks behind Afghanistan or Mozambique, and bottled wine is simply too expensive for most Georgians. Instead, they make their own wine from backyard vineyards, or buy cheap wines ‘en vrac’. The UK is seen as one potential life-saving market, and hence the prophetic nature of the Chamber of Commerce’s decision to invite UK and other European judges to participate in a national wine competition. And so it was that one morning in May I set off on the long route to Tbilisi. I was to act as Chairman of Judges, with a responsibility for keeping my fellow judges – from England, Holland, the Ukraine, Russia and Georgia – in check, and with a casting vote in any split decisions. That was to prove useful. The judges were cast into a Maelstrom of press interest. The Russian ban is a huge story throughout central Europe, with a dozen TV crews and 50 reporters scrambling for a story, from Russia, the Ukraine, Turkey, Reuters and the BBC, and huge local interest. As Chairman of Judges I endured my three days of ‘celebrity’, with a round of breakfast TV, news and other interviews. The story, of course, was not so much the competition or even the wines, but the politics and what a panel of experienced international judges would make of these wines, so long revered by Russian drinkers, and now branded as unfit for human consumption. Right: part of the press pack covering the awards dinner in Tbilisi. 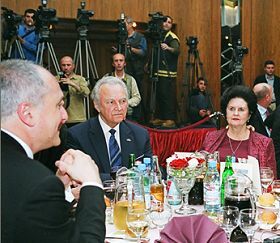 Left to right: David Lordkipanidze, Director National Museum of Georgia; Arnold Ruutel, President of Estonia and his wife. The wines were to be tasted blind, with each judge recording their scores. As a check that this diverse panel was ‘calibrated’, I stopped the judges after the first half dozen of the 135 wines we were scheduled to taste, and asked each to read out the score they had award: 14-16 points being worthy of a commendation, 16-18 a silver medal, and 18-20 a gold medal. 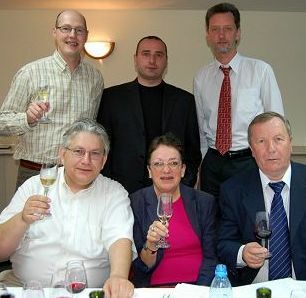 From back left, clockwise: Tom Cannavan, UK; Nugzar Ksovreli, Georgia, Oleg Filippov, Russia, Christian Callec, Netherlands, Rosemary George, UK, Anatoly Yalanetsky, Ukraine. We did that, with a little compromise and understanding on both sides. Our Georgian judge (a very experienced winemaker, trained in the west) explained the ‘typical’ character of some traditional Georgian wines, like the one we’d just tasted. Whites are sometimes made like red wines: fermented with their skins for many days, even weeks, with plenty of exposure to oxygen. This gave a rich but oxidised and somewhat fruitless character to the wines, that was far from modern tastes and international standards. Similarly, some reds lacked fruit and were rather sour: again, a traditional style. But other than these traditional style – and some wines that showed evidence of winemaking faults – there was plenty to get excited about, with clean, crisp, delicate whites that were vibrant and full of character, and some really juicy, distinctive, well-balanced reds. These wines were far more modern in style, but the best retained a vivid signature of grape and place. Through a lot more sampling and discussion the panel of judges managed to calibrate more closely, with the western judges recognising and respecting traditional styles a little more, and the eastern judges acknowledging that by international criteria, these wines could not be judged as ‘gold standard’. The only Georgian wines in the UK at present are the Old Tbilisi and Tamada brands from the Georgian Wine and Spirit Company (GWS), now owned by Pernod Ricard (£4.99 – £6.99, Ocado,Sainsbury’s Calais, Bristol Wine, Soho Wine Co, Peake Wines, Sussex Victuallers, Caves de Pyrene, Mortons). There has been substantial investment in vineyards and winery equipment, and the progressive GWS picked up one gold and two silver medals, with a clutch of commendations. The full results for the competition can be see at the Georgian National Wine Competition 2006 website. My week in Georgia introduced me to a people with a proud history, a deep-felt love of wine, and an appetite to address the problems facing their industry. In a world where eminent experts can’t tell first growth Bordeaux from Californian Cabernet, there is no doubt these unique grapes from a rich cultural winemaking heritage have potential: especially the potential to excite jaded consumer palates.